Can't see the flash video? Please click here to download MP4 version. Introducing the amazing WunderClip. All natural pain relief literally at your fingers. No pills, no powders, no potions, no kidding. It has long been know that the application of pressure to specific areas of the body relieves pain. As an example, a reflexology massage to relieve sore aching muscles is really just a form of applying pressure. The WunderClip takes this knowledge and applies it to a specific pressure point known as LI4, which is found in the webbing between the thumb and the index finger. Slip the WunderClip on to the proper spot and feel the results. 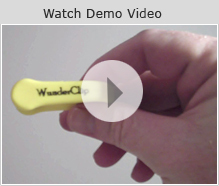 The patented design of WunderClip is compact, unobtrusive, stays in place, and since it is reusable many times over, is extremely cost effective. Best of all there are no lists of potentially dangerous chemicals to read through, no bad reactions or overmedicating to worry about, and no having to worry about how to dispose of old drugs and their impact on the waste stream. There is a safe, natural source of healing power in everyone, unlock yours today with the WunderClip.